There's Always a Reason to #RideonOver! 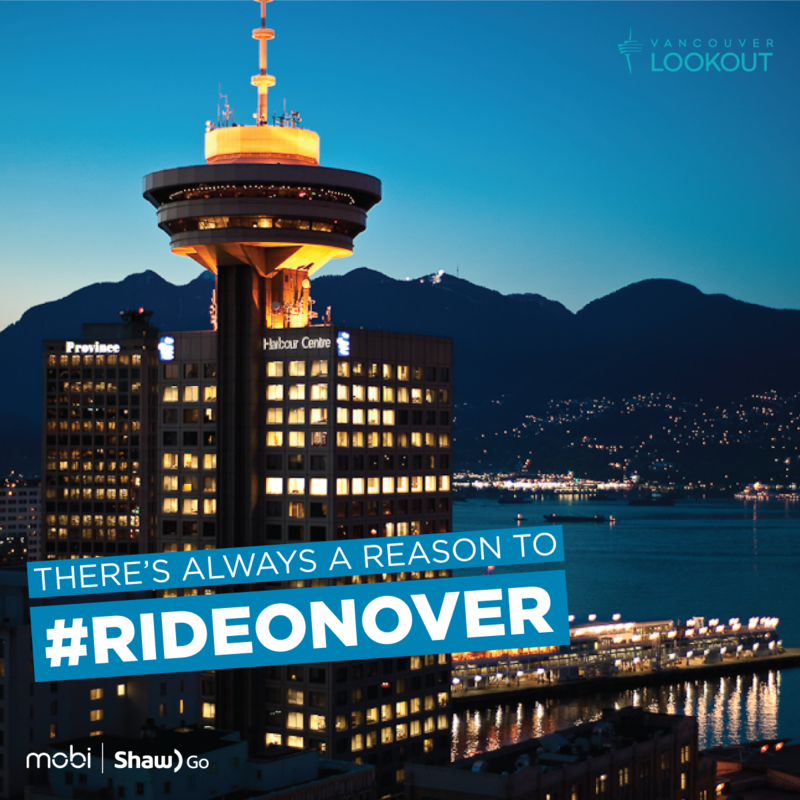 Vancouver Lookout will be offering all Mobi by Shaw Go Members a buy-1-get-1-free Adult Admission. This offer is valid from September 13 - October 13, 2018, at the top of the Harbour Centre at 555 W Hastings Street with proof of Mobi by Shaw Go Membership (Fob or account information on the app or website). Vancouver Lookout has been one of the most iconic and recognizable landmarks in Vancouver. Vancouver Lookout is situated 170 metres/450 feet high above Vancouver in the heart of the city and the perfect “BEST FIRST STOP”, providing a breathtaking bird’s eye 360 ° view of one of the most beautiful cities in the world. Our welcoming and knowledgeable staff will provide complimentary 360° tours describing Vancouver’s infamous landmarks and landscapes or explore your own and discover fascinating facts about Vancouver through our interpretive displays posted on the deck’s perimeter. Tickets are valid all day, guest can enjoy both the day and night views. Vancouver Lookout is located in the heart of the City at top of the Harbour Center, across the street from Waterfront Station, a short walk from major hotels, and only a few blocks from the Vancouver Convention Centre, the Cruise Ship Terminal, and historic Gastown.